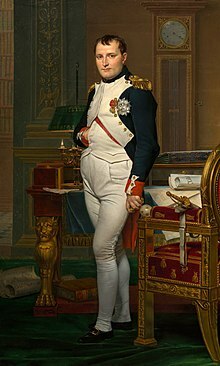 General of the French Revolution; the ruler of France as First Consul (Premier Consul) of the French Republic from 11 November 1799 to 18 May 1804; then Emperor of the French (Empereur des Français) and King of Italy (Re d'Italia) under the name Napoleon I from 18 May 1804 to 6 April 1814; and briefly restored as Emperor from March 20 to June 22 of 1815. Memoirs of NapoleonGutenberg, please copy to Wikisource! Letter to the Pope, 1804. Letter to the King of England, January 2, 1805. Conversation with Decier Regarding the Marriage of Jerome Bonaparte, May 6, 1805. Letter to Jerome Bonaparte, May 6, 1805. Address to the Army at the Beginning of the Campaign, March, 1796. Proclamation to the Army, May, 1796. Letter to "The Directory," May 11, 1796. Letter to "The Directory," May 14, 1796. Proclamation to the Soldiers on Entering Milan, May 15, 1796. Proclamation to the Troops on Entering Brescia, May 28, 1796. Address to Soldiers During the Siege of Mantua, November 6, 1796. Address to the Troops on the Conclusion of the First Italian Campaign, March, 1797. Address to the Genoese, 1797. Extract from a Letter to the Directory, April, 1797. Address to Soldiers after the Signing of the Treaty of Campo Formio, October, 1797. Proclamation to the Cisalpine Republic, November 17, 1797. Proclamation on Leaving the Troops at Rastadt, November, 1797. Address to the Citizens after the Signing of the Treaty of Campo Formio, December 10, 1787. Proclamation to the Troops on Entering Toulon, May 9, 1798. Address to the Military Commissioners, May 16, 1798. Proclamation to the Troops on Embarking for Egypt, June, 1798. Proclamation to the Egyptians, July, 1798. Letter to "The Directory," July 24, 1798. Order Respecting the Government of Egypt, July 27, 1798. Letter to Tippoo Saib, January 25, 1799. Proclamation to the Army on the Abandoning of the Siege of Acre, May, 1799. Proclamation to the Army on His Departure for France, August, 1799. Proclamation to the French People, November 10, 1799. Proclamation to the Army of the East, November, 1799. Proclamation to the French before the Second Italian Campaign. Proclamation to the Soldiers before the Battle of Marengo, June, 1800. Letter to the Emperor of Austria, on the Field of Marengo, June, 1800. Address to the Senate, 1805. Proclamation to the Troops on the Commencement of the War of the Third Coalition, September, 1805. Address to the Austrians, after the Fall of Ulm, October, 1805. Address to the Troops after the War of the Third Coalition, October, 1805. Proclamation to the Soldiers before the Battle of Austerlitz, December 1, 1805. Proclamation after the Battle of Austerlitz, December 3, 1805. Address to the Soldiers on the Signing of Peace with Austria, December 26, 1805. To the Legislative Body before the Battle of Jena, October, 1806. Address to the Captive Officers after the Battle of Jena, October 15, 1806. Proclamation to the Soldiers before Entering Warsaw, January 1, 1807. To the King of Prussia, Entreating Peace after the Battle of Eylau, February, 1807. Address to the Army on Its Return to Winter Quarters on the Vistula, 1807. Proclamation to the Soldiers after the Battle of Friedland, June 24, 1807. Proclamation to the Spaniards on the Abdication of Charles IV., June 2, 1808. Address to the Legislative Body before Leaving Paris for the Spanish Campaign, 1808. Letter to the Emperor of Austria, October, 1808. Proclamation to the Soldiers during the March for Spain, 1808. Summons to M. de Morla to Surrender Madrid, December 3, 1808. Proclamation to the Spanish People, December, 1808. Proclamation to the Soldiers before the Battle of Eckmuhl, April, 1809. Proclamation to the Troops at Ratisbon, April, 1809. Address to the Troops on Entering Vienna, May, 1809. Proclamation to the Hungarians, 1809. Address to the Troops on the Beginning of the Russian Campaign, May, 1812. Address to the Troops before the Battle of Borodino, September 7, 1812. Letter to Alexander I., Emperor of Russia, September 20, 1812. Proclamation to the French People on His Return from Elba, March 5, 1815. Napoleon's Proclamation to the Army on His Return from Elba, March 5, 1815. Proclamation on the Anniversary of the Battles of Marengo and Friedland, June 14, 1815. Proclamation to the Belgians, June 17, 1815. Bonaparte's Protest, Written on Board the Bellerophon, August 4, 1815. Order to Seize all English in France, Announced in the Moniteur, May, 1803. Address to the Troops on Presenting the Colors, December 3, 1804. Proclamation to the Soldiers, February, 1806. Address to the Senate on Annexation of the Cisalpine Republic, 1806. Letter to Champagny, November 15, 1807. Letter to the American Minister, Armstrong, 1809. Discourse at the Opening of the Legislative Body, Feb. 14, 1813. Address to the Legislative Body, December, 1813. Address to the Guard, April 2, 1814. Speech of Abdication, April 2, 1814. Farewell to the Old Guard, April 20, 1814. History of the United States 1801-09 (1889-90) by Henry Adams recounts the circumstances surrounding the Louisiana Purchase and Napoleon's influence on the United States afterwards; see table of contents for links to vol. 1: ch. 13-17; vol. 2: ch. 1-3, 12, 16; vol. 3: ch. 16; vol. 4, ch. 5. This page was last edited on 6 June 2018, at 09:23.